Artistically and technically this is a satisfying performance. Claude Debussy wrote his first string quartet in 1893 and planned a second as part of the series of six chamber works of which only half were to be completed in 1915, when the composer was depressed by the war and the fatal disease, which brought about his death three years later. The existing string quartet, however, stands at the threshold of his career and at the threshold of the new music that a new century was to bring. At the Conservatoire Debussy had won the Prix de Rome in 1884. Early in 1887 he was able to return from his unwelcome obligatory stay at the Villa Medici in Rome and refused the expected provision of an overture for a public concert of his work in Rome, an event that consequently had to be cancelled. In his personal life at this time Debussy seems to have embraced a fin-de-siècle hedonism that led him into a number of liaisons of an unfortunate kind. From 1888 he enjoyed a stormy relationship with Gaby Dupont that was to last nine years, interrupted by his engagement in 1894 to the singer Thérèse Roger, the cause of the end of his friendship with Chausson. Gabrielle Dupont tried to shoot herself in 1897, but survived. Two years later Debussy married his first wife, Dupont's friend Rosalie Texier, a mannequin, whom he deserted in 1904 for the married woman who was to become his second wife. The vie de Bohème with Dupont, however, is also of the period of those remarkable settings of Verlaine, of the Prélude á l'après-midi d'un faune based on Mallarmé and of early work on the Maeterlinck opera Pelléas et Mélisande. The string quartet looks forward in many ways to the musical language that Debussy was to develop as entirely his own, characteristic in its use of modal and whole-tone scales, in its subtle harmonies and texture and in its clarity of form. The four movements are thematically related, in the manner suggested by the work of César Franck. The first movement retains the general shape of a classical first movement. The following scherzo is dominated by the viola theme with which it opens and leads to a slow movement that suggests the medieval or pre-Raphaelite world of Pelléas et Mélisande. The final movement opens in contrapuntally angular fashion, proceeding to an allusive summary of something of what has passed. The quartet was given its first performance in December 1893 by the Ysaÿe Quartet in Paris. If Debussy was to despise the Prix de Rome, for Ravel it was to prove a cause of public scandal. At the Conservatoire, which he had first entered in 1889, Ravel had variable success, and consistently failed to win the Prix de Rome even when he had established his reputation in the wider musical world of Paris. His failure to win the prize in 1905, caused in part by his deliberate unwillingness to follow the academic rules of the competition, led to the resignation of the director of the Conservatoire, the conservative Dubois, and his replacement by Ravel's teacher Gabriel Fauré. Ravel wrote his only string quartet in 1902, dedicating it to his teacher Fauré. The work was to excite comment and there were comparisons with Debussy's quartet, which had obviously influenced the younger composer. Ravel was never to disparage Debussy, but the latter grew to resent suggestions of Ravel's influence on him, which at times seemed evident enough. The quartet opens with one of those characteristically nostalgic melodies, replete with yearning for an unattainable past, a mood of which Fauré was a master. The second theme suggests a theme to be used a few years later in the Introduction and Allegro, here poignantly announced by first violin and viola. There is a scherzo of subtle rhythmic complexity with thematic links to the first movement and leading to a slow trio section in which the resources of the quartet are fully explored. The slow movement offers music of suggestive delicacy, evocative of a past world and this leads to a lively final movement of rhythmic asymmetry but thematically re1ated to what has gone before. 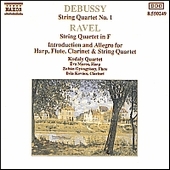 Ravel wrote his Introduction and Allegro for harp, flute, clarinet and string quartet in 1905. Relatively simple in conception, this work contains in it the spirit of an age and of a poetic national mood. The harp is beautifully handled in music that expresses beyond the power of words that world on which Ravel had earlier touched in his Pavane pour une infante défunte. "Artistically and technically this is a satisfying performance." Claude Debussy exercised widespread influence over later generations of composers, both in his native France and elsewhere. He was trained at the Paris Conservatoire, and decided there on a career as a composer rather than as a pianist, his original intention. His highly characteristic musical language, thoroughly French in inspiration, extended the contemporary limits of harmony and form, with a remarkably delicate command of nuance, whether in piano-writing or in the handling of a relatively large orchestra. French, of paternal Swiss and maternal Basque descent, Ravel combined skill in orchestration with meticulous technical command of harmonic resources. He wrote in an attractive musical idiom that was entirely his own, in spite of contemporary comparisons with Debussy, a composer his senior by some twenty years. The Kodály Quartet, formed in Budapest in 1966 when its original members met as students at the Ferenc Liszt Academy of Music, has continued to exemplify the greatest standards of the rich Hungarian musical tradition that it has carried on with such extraordinary distinction throughout the world during over four decades of international appearances. The Kodály Quartet has toured almost every European country, the United States, Central and South America, the Far East, Australia and New Zealand. In addition to the standard classical repertoire, the Quartet regularly performs works written by Hungarian composers such as Kodály, Bartók, Dohnányi and others. In recognition of its achievements the Kodály Quartet has received the Ferenc Liszt Award (1970), Artist of Merit of the Hungarian Republic (1990) and the Bartók-Pasztory Award (1996). International critics have been lavish with their praise for the Kodály Quartet’s numerous (over fifty) recordings, including the monumental undertaking of the highly acclaimed complete cycles of Haydn, Beethoven and Schubert for Naxos. The Quartet was also honoured with Classic CD magazine’s Award for the best release of 1993 in the chamber music category (Haydn String Quartets Op. 64). For Naxos and Marco Polo the Kodály Quartet has recorded the complete string quartets of Beethoven, Haydn and Schubert and also quartets and quintets by d’Indy, Ravel, Debussy, Schubert, Brahms, Schumann and Bartók. The Quartet’s recording of the Opus 76 Haydn Quartets gained them a Penguin Guide Rosette. When the Haydn quartet cycle began, the members of the quartet were first violinist Attila Falvay, second violinist Tamás Szabó, viola player Gábor Fias and cellist János Devich. The last three of these were formerly in the Sebestyén Quartet, which was awarded the jury’s special diploma at the 1966 Geneva International Quartet Competition and won first prize at the 1968 Leo Weiner Quartet Competition in Budapest. Since 1971 the quartet has been known as the Kodály Quartet, a title adopted with the approval of the Hungarian Ministry of Culture and Education. Second violinist Erika Tóth joined the Kodály String Quartet in June 2005. To commemorate the 200th anniversary of Haydn’s death (2009), the Kodály Quartet’s recordings of his Complete String Quartets has been released as a 25-CD Box Set (8.502400) to renewed critical acclaim. For more information, please visit www.kodalyquartet.com.